Mahogany Products Limited is the manufacturers of Tex’s brand products. Based in Brearley Street, Hockley, Birmingham, Tex is another one of the region’s success stories. They have a distribution deal with Enco, the largest importer and distributor of Afro-Caribbean food and drinks in the UK and Europe. 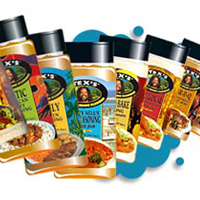 The Tex range has around 19 different products including seasonings and meat coatings. The seasoning recipes are all based on original and genuine family recipes which originated in the Caribbean and the South of the US and have been in existence for over 70 years. The original chicken coating was the first product launched by the company and is still the most popular of all the products. Combine marinade ingredients in a bowl and add both chicken and steak to the marinade mixing well. If preferred the meat can be left to marinade for 1 hour. Remove meat and leave marinade for basting the kebabs. Thread steak, tomatoes, onions, chicken and peppers alternatively on skewers. Cook under a hot grill, turning frequently and basting with reserved marinade as required.